Certified organic and vegan talc-free translucent Baked Powder. Colour matched with Coleur medium Fluid Foundation and medium Concealer. Anti-ageing makeup. suitable for sensitive skin. 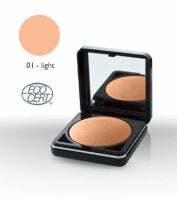 TThis translucent medium Baked Powder guarantees a silky light-as-a-breeze texture, giving a matt finish and subtle colour at the same time. Nourishes with patented beta glucan, macadamia nut oil, evening primrose oil, and red grapevine extract. Comes complete with a separate sponge com-partment for hygienic and clean storage.